Over the past few years, woven bamboo plywood has become an increasingly popular construction material. Several reasons stand behind its newly gained popularity. First and foremost, the bamboo plant grows to harvesting age very quickly. Secondly, compared to other construction materials used around the world, it has above-average compressive and tensile strength. Bamboo is a type of plant that is widely spread in Asia, Australia, both American continents, and sub-Saharan Africa. It is assigned great cultural importance in Asia, where it has been used as both as a food source and as construction material for several centuries. Woven bamboo plywood has a myriad of applications. Anything from walls, panels, roofs, and furniture, to sports equipment, musical instruments, and children's playground equipment can be made out of bamboo plywood. The versatility of bamboo plywood comes from different factors: its strength, its durability, its higher resistance to moisture, and its affordable price tag, in comparison to other construction materials. All of these factors make it a great option for furniture, walls, floors, fencing, and other construction jobs that require a reliable material. The bamboo plywood manufacturing process begins with the careful selection and harvesting of bamboo plants. There are more than ten thousand types of bamboo across the globe. The "Moso" type is the most commonly used type of bamboo for making plywood. Originally found in areas of China and Taiwan, the Moso bamboo has been naturalized over the years to grow in other parts of the planet. It can grow up to 10-12 meters high in just 4 years, making it widely used in the construction industry. The roots of bamboo plants form a very large system, thus there is no need for replanting after it has been harvested. Once the plant has been harvested, it is carefully inspected for any damage or imperfections. These are most commonly caused by pests, but can also be caused by weather or other outside interference. Once the bamboo passes the initial inspection, it is sent to a plywood production facility. Facility workers cut the bamboo into multiple slats. These slats are treated with a sodium borate solution that will kill off any potential pests that could potentially cause damage in the long term. The cleaned slats are then kiln-dried until the moisture levels drop to below 10%. Moisture levels of about 6-8% are ideal for making durable bamboo plywood. After the pest and thermal treatment, the slats are once again inspected and divided into two categories: surface material or substrate material. Only the best slats are used as a surface material. 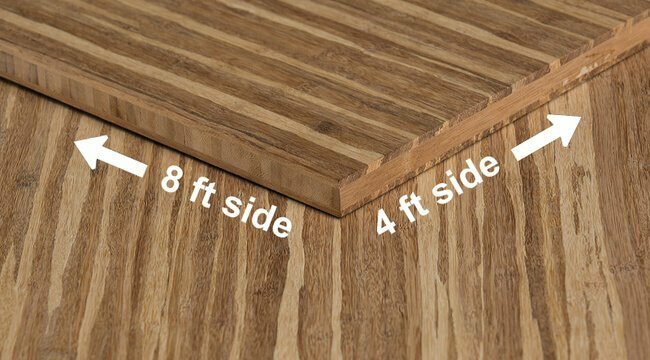 The wood grain of each slat is arranged at a 45 or 90 angle from the previous one. This process increases the strength and durability of bamboo plywood even further. The final product is obtained by gluing the slats together and putting them under a hydraulic press. Studies have shown that bamboo has a higher compressive strength than concrete and a tensile strength that is close to steel. In practical terms, it means that it won't reduce in size, nor elongate, due to external loads. Take special care when trying to insert screws or nails within 2-3 cm from the edge. In order to avoid any cracks, splits, and shatters, it's advisable to use pilot holes. Most factories and retailers supply the bamboo plywood as unfinished. Unfinished plywood is the type of plywood that has had no artificial stains or finishes applied beforehand. This adds to the versatility of the product because each buyer can later decide if he wants to keep the natural aspect of the product or apply certain artificial coatings to it. If you decide to add a stain and a finish to your bamboo plywood, make sure you follow the next steps in order to achieve the best result. The best results are obtained only after you've completed a few preparation steps. First of all, you should designate a room to be your work area, and take care how you store the plywood. As with most species of wood plywood, you will want to avoid storing the panels vertically as this may cause warping. Always store the panels flat on the ground or pallet on which they arrived. Next, ensure that the temperature of the workroom should always be between 30 degrees (F) and 90 degrees (F), and the humidity levels should always be maintained at between 40%-60%. Once the temperature and humidity are set, the plywood sheets need to acclimate to the temperature and moisture of the room. The acclimation process should take around 3-10 days. Once the acclimation process is complete, inspect the panels for imperfections or surface defects. If found you can use a 150-grit, very fine, sandpaper to and then brush off any remaining debris with a clean cloth. The woven bamboo plywood is now ready for staining. The first step of the staining process is to lay the sheet in a horizontal position. You can use the floor or a workbench. It's advisable to complete the staining process indoors because the chance of dust, dirt, or other debris getting on the plywood sheet is smaller. Carefully use a brush to cover the sheet of plywood with wood conditioner. This will ensure better stain penetration, although it will also absorb some of the stain color. If the final color is lighter than expected, add a second layer. Our clients have reported success using Penofin Hardwood formula: http://www.penofin.com/wood-stains/hardwood-formula-wood-stain. You can sand to 300 grit and then use 2 coats on each side after sanding. It will slightly darken the bamboo and give it a rich glow. For best results remember to add the stain along the grain. If you're adding the stain in a different pattern, you might not achieve the desired effect, or even worse, you might damage the product. Once you're satisfied with the hue, let the plywood cure for up to 24 hours. Besides changing the color of the product, artificial staining also creates a thin, protective coating that increases the resistance to moisture and damage. Finishing is the last step of the bamboo plywood manufacturing process. You can use oil, wax, or polyurethane to coat your new plywood sheet. Each has its own pros and cons. Oil is the most commonly used type of finish. Mineral oil is great for surfaces that will come in contact with food and other edible products. Linseed oil is great for indoor surfaces that don't come in contact with edible products. Tung oil is your best choice if the surface you're coating is going to be used outside, as it will provide the best overall protection. Wax on the other hand is not as commonly used, but it's just as good for indoor surfaces, we've had good results with products such as Minwax Paste Finishing Wax. Keep in mind that the coating provided by waxes and oils are not always long-lasting. Wax is especially useful for surfaces that come into contact with edible products. You can also use standard polyurethane coatings for a high gloss and more durable finish. These coatings can be brush-applied following the bamboo plywood manufacturer's instructions for quick and easy application. 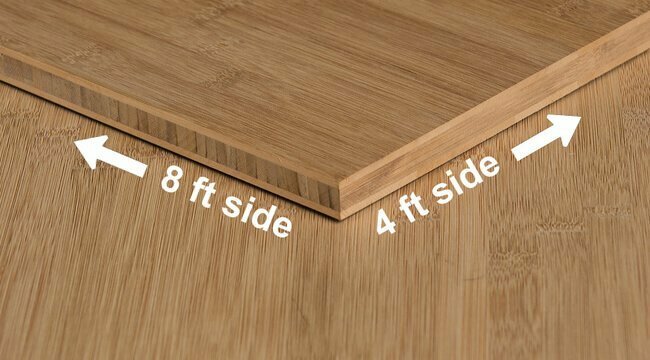 The most common size of bamboo plywood is 4ft by 8ft. As a decorating material It comes in a very affordable price range, with prices mostly depending on the finish, the color, the grain, and the thickness. In comparison to solid wood, bamboo is similar in pricing, depending on which species you compare it against. Most wood species are not available in plywood due to prohibitive prices. Bamboo plywood is affordable and readily available. 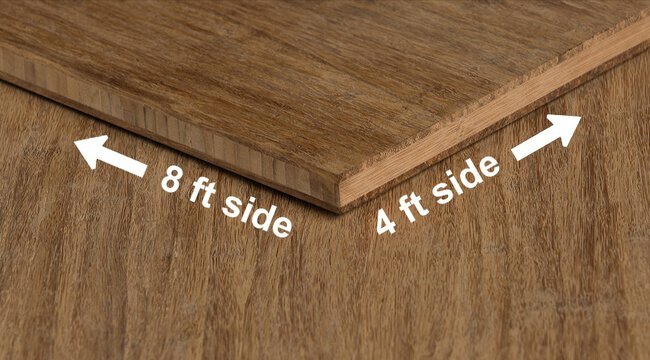 The thicker and harder, the more expensive this plywood is. 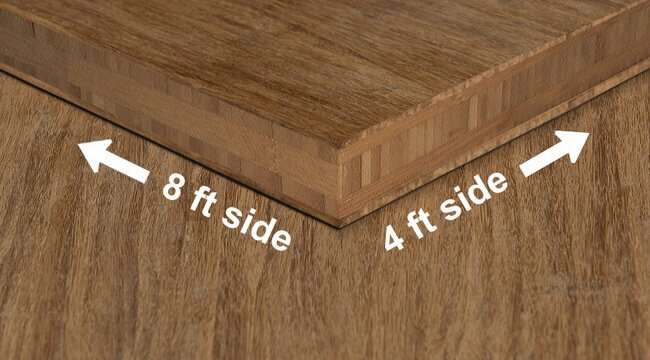 If you're on a budget, for example, can buy the most common 1/4" thick sheets in the $110-$150 range and 1/2" thick sheets can set you back anywhere from $120-$180 depending on the grain. If you're looking to buy thicker sheets used for counter tops and butcher blocks, prices can exceed $300. The affordability of bamboo plywood is due to the fact that the re-growth period of bamboo is a fraction of that of other wood species. Each bamboo plant takes around 4 years to grow to harvesting age and doesn't need to be replanted after each harvest session. This translates into an increased global availability. Moreover, the process that transforms the newly harvested plant into plywood sheets is cheaper and requires a smaller workforce to complete. Although the process is faster and requires fewer men, the final product is just as sturdy (if not more so) and beautiful than other plywood types. Higher prices don't always mean higher quality. If you're trying to buy bamboo plywood and it seems to be too expensive, you should check reviews for that brand. Paying extra for the brand won't do you any good. In the end, if you have a home project or you're thinking about refurbishing your house with trustworthy material that will stand the test of time, bamboo plywood should be one of your top choices. One of the main advantages of using bamboo plywood over other types of plywood is the fact that bamboo is a rapidly renewable material, and it also happens to have a gorgeous finished look. Bamboo plywood is made from carefully harvested bamboo plants that are treated against termites and other pests. The process is finalized after 3 or more bamboo sheets are pressed together in a hydraulic press, with each sheet having its wood grain oriented at a 45- or 90-degree angle from the previous. 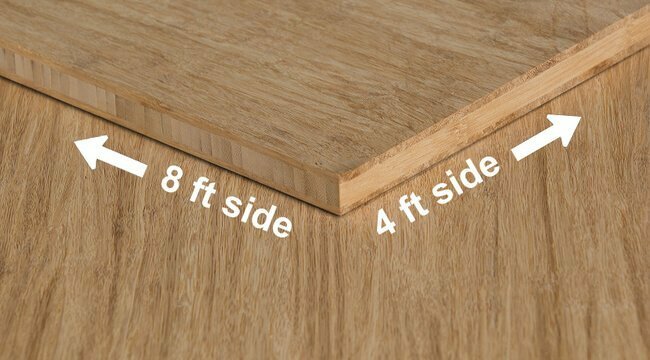 Our plywood is made from pressing and laminating together multiple sheets of wood with the direction of the wood grain alternating with each sheet. The process gives the plywood strength and stability. Bamboo is also a very versatile material, as unfinished plywood can have its natural color, or it can be carbonized or even stained. Whichever the case, with unfinished bamboo the installer can add a stain to match their desired design. Affordable and eco-friendly, bamboo plywood and building materials in general will continue to grow in popularity over the coming decades. Bamboo is one of the fastest growing plants on the planet. While it's not as tall or thick as hardwood trees, bamboo plants make up for it in sheer growth rate. Moreover, due to its rapid renewability, abundance of resource, dimensional stability, and tensile properties, bamboo makes an ideal material for plywood. The simple and clean look of finished bamboo has resulted in a trend towards all types of bamboo furniture and cabinetry. Leading designers around the world are now discovering the beautiful marbled grains and increased durability of strand woven bamboo plywood as well. If you're a fan of wood furniture, you're going to love furniture made out of bamboo for its sleek design appearance. Any piece of furniture can be created using bamboo plywood and the final product will be aesthetically pleasing and better for the environment than real wood. Across the world, bamboo plywood is used as wall paneling to create gorgeous interiors in all types of residential and commercial interior design, from hotels to spas to banks to restaurants to high end homes. It brings nature indoors and adds a clean feeling to any environment when used as a wall. It provides a classic and simple surface, it looks good, and it's durable. If you're a music enthusiast, you might already know that plywood has been making its way into the musical instruments design. Basses, guitars, and even pianos have been made completely out of bamboo plywood. Many musicians prefer the acoustical qualities of bamboo as compared to wood. Strand woven bamboo plywood, due to its dense outer layers, is often used in the manufacturing of stereo containment furniture and shelving. Moreover, since bamboo grows much more rapidly than other woods, and is more abundant, the availability of bamboo is higher than that of other wood types, thus making musical instruments more affordable. As with the other examples in the list, sports equipment can also be a do-it-yourself job if you're using bamboo plywood. Especially useful for outside sports, you can build anything from basketball backboard panels, to bikes, and even boats. All you need is the right set of tools and a piece of paper with the design and dimensions of the final product.